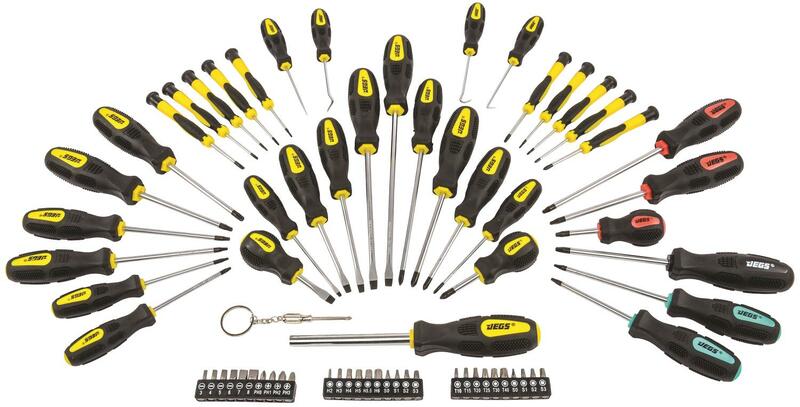 Fill your tool box with JEGS 69 piece Screwdriver Set or get the basics with JEGS 30 piece set. JEGS Screwdriver Sets offer several sizes of Phillips and slotted style screwdrivers with magnetic shaft tips to give you extra control and comfortable rubber handles for maximum grip. Handles come detailed with the JEGS logo plus each screwdriver set comes complete with assorted power bits. 80755 - JEGS Screwdriver Sets is rated 4.8 out of 5 by 132. Rated 5 out of 5 by rasjr67 from Work great Bought these because I had some like it before and never a issue. So far they are just as good!! Rated 5 out of 5 by Bons from Screw driver set Great set of hand screwdrivers. Nice handles and being colorful , they’re are easy to see. Rated 5 out of 5 by Steven67 from Every kind of screwdriver I’ll ever use I like these screwdrivers because the tips are magnetic and there’s one for any kind of job you’ll do. Rated 5 out of 5 by SC360Hornet from Great Set of Drivers - Great Value I'm VERY happy with this purchase. I cannot believe that this driver set was so inexpensive. I got it on sale price. Huge variety. Well crafted. Nice, soft rubber handles. I combined these with a 20+ year old collection of Craftsman, Mac, etc...I now have everything I could possibly need. See pic - Jpeg's drivers are black and yellow. Good stuff here with a great price. Rated 5 out of 5 by Richard L from Fantastic Deal I bought these for my brother who usually buys SnapOn tools and he was impressed with the overall quality. I was also impressed with the large assortment to handle all your needs and the fantastic pricing. Rated 5 out of 5 by Lele from Great product Great set and very good price. Very happy with this purchase. These will have a 1 year warranty. What country are these tools made in? These are manufactured to our specification in China. What sizes are the Torx bits on the screwdrivers and on just the bits? Does this come with a case to keep them organized?